Smithfield Golf Club of Statesboro, Georgia, is the best championship golf course in the area, complete with a driving range, golf cart rentals, and beverage bar for your convenience. Since 1997, we've continued to be the course of choice for golfers of all ages, offering a family-oriented club with a "home away from home" atmosphere, where you're always treated fairly. Learn more about why Smithfield Golf Club in Statesboro, Georgia, is the only course for you by contacting us today to schedule a time on the green. Smithfield Golf Club is an 18-hole, par 72 championship golf course with large practice facilities and a full deli. We also have a beautiful 1,800-square-foot lake house that overlooks our 350-acre lake. The lake house is available to rent and includes a large entertainment room, full kitchen, grill, and bathroom. It is perfect for weddings, birthdays, graduations, anniversaries, and parties of all types! 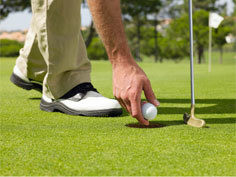 Our golf club can become a quaint escape from your day-to-day life. One can enjoy the endless amenities of our club by becoming a member. Your membership will include numerous benefits, no initiation fee, and monthly dues. Join our golf club today and see what you've been missing! Hear more about our tee times and prices by contacting Smithfield Golf Club today at 912-839-3933 in Statesboro, Georgia.